i'm still alive. i have a fever today. KatyM wrote: i'm still alive. i have a fever today. so that's you in the picture? na, it's one of my rare non-autobiographical comics. I don't think I completely get it, but I'll give it a 3/5 nonetheless for that hot (literally) Fire Bra. we'll just imagine that it's you, then the joke is better! Bah, I was gonna use that. This is a great comic and very funny. It makes me wonder if she's the reason this guyneeds help picking a tie. Null wrote: This is a great comic and very funny. I don't think she had that in mind when she was drawing that. I really doubt it. Who said she had to? Just because it wasn't intentional, is Null now not allowed to say "Hey! They work together! What a coincidence!"? For the record, no, I was not implying that KatyM drew this as a sequel or prequel. That's why I used the phrase, "It makes me wonder" which generally denotes speculative thought, possibly (in this case)connecting two disparate events which were not meant to follow logically, but can be seen (in the proper context) to have similar elements which might (possibly) allow some (but not all) folks to see some similarities. And if some (other) folks don't see any possible similarities, or any evidence of (speculative) connection, that doesn't mean that those folks are not special in their own way. To sum up: I like KatyM's cartoon, it reminded me (and only me) of one of my own cartoons (peripherally) and I thought I'd mention that. Yeah, but you weren't actually wondering about her deviless (female devil?) dating the devil character you drew, you were drawing a correlation between the two comics, correct? I mean - I don't see how you can wonder if that's why he needs the tie. You can't possibly think that these two are related on that level; you know they're just drawings, right? And how do exactly did you format it to fit my screen? I'm not following. Also, what's name of the first baseman? You guys don't make sense a lot of the time. draculahunter wrote: Yeah, but you weren't actually wondering about her deviless (female devil?) dating the devil character you drew, you were drawing a correlation between the two comics, correct? Incorrect. I was not drawing a correlation between the two comics. I noted a funny cartoon; I noted one of my own that followed along a possible similar premise, and (I mistakenly thought) joined the two, just for a brief bit of (supposed but not really) fun. Do I think KatyM was even aware of the other cartoon? No. Does it matter? No. For the record, I'm fully capable of enjoying work without thinking, "Hey, does this derive from my own ideas?" I apologize for seeing a (possible) parallel in this work, which has nothing to do with either KatyM's work or my own. I'll be more cautious in my praise in future, thanks. Apologies to KatyM for apparently impugning her work. Your signature adds to that post, somehow. Excuse me. I had something stuck in my throat. 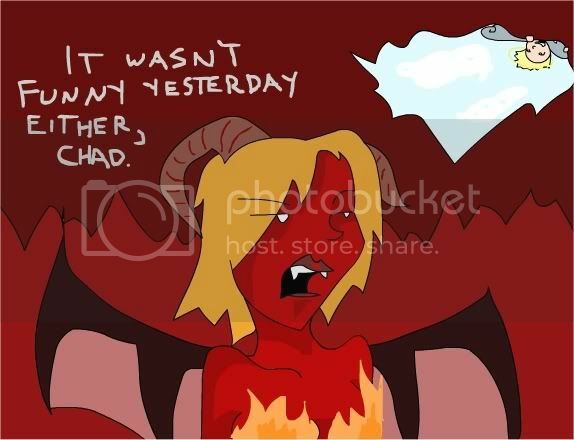 It really is an unwritten rule of the universe that people named "Chad" are dicks isn't it? Every job I've ever worked seemed to at one point employ a Chad, and he was almost always universaly loathed, by EVERYONE. Let's just face the fact that if you're named Chad, it's your goal in life to be Scrappy Doo incarnate and just get on everyones nerves. My threads always turn in to arguments abouts something. I don't know how this happens. I'm not sure that was an argument, but sorry about that anyway. Arguing with drac is like arguing with a paper bag with a face drawn on it. Null wrote: I'm not sure that was an argument, but sorry about that anyway. KatyM wrote: My threads always turn in to arguments abouts something. I don't know how this happens.